Jo Blake, Senior Manager Talent Acquisition, accepts the award. 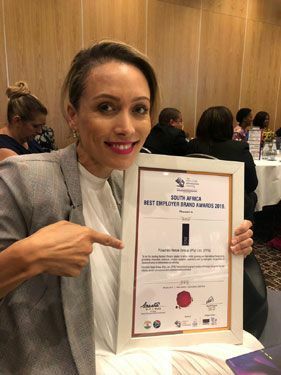 Fashion lifestyle retailer, TFG, was presented with the “Best South African Employer Brand” award at the 14th Employer Branding Awards which took place in Sandton last week. Hosted by the Employer Branding Institute, the award ceremony celebrated and acknowledged top organisations and individuals from various industries across South Africa. Aligning employee benefits and encouraging employee engagement.